IT took 18 days, but friends and family of the alleged mastermind behind the web of corruption in Marbella have raised his one-million-euro bail. Juan Antonio Roca walked free from prison in Granada – two years since his arrest on charges of urban corruption, fraud, money laundering, embezzlement, the misappropriation of public funds, falsifying official documents and the illegal possession of firearms. Judge Óscar Pérez – who granted bail for the former chief of urban planning at Marbella town hall in late March – announced a bank transfer from Roca’s lawyers during a hearing at court number 5 in the Costa del Sol town. 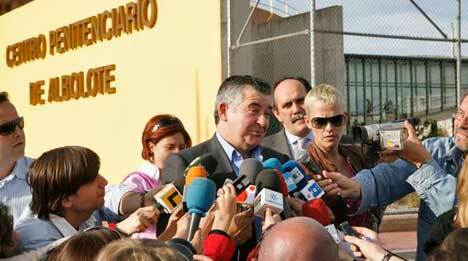 Under the bail conditions, Roca has to attend court everyday and not go within 500 metres of an airport. This is over continuing police fears the former chaffeur, who is claimed to have amassed a 200-million-euro fortune during his time at the council, will flee Spain. Investigators believe he has hidden bank accounts in tax havens around the globe. Roca, who was freed from Albolote prison in the early evening of April 14, told reporters he has been victimised during the two years he spent on remand. “Since my arrest in 2006, the state prosecutor, the regional government and the council of Marbella have blamed me for all the ills of Spain,” he said maintaining his innocence. The decision to bail Roca was unsuccessfully appealed by the public prosecutor, the regional government and the current administration of Marbella. “It is an absolute insult that the man who stole millions of euros from the council is free to walk the streets,” a spokesman for the town hall of Marbella said. Former chaffuer Roca was arrested on March 31, 2006 during Operation Malaya investigation. Police believe he asked for money in exchange for building licenses in a corruption ring that has seen 86 people, including councillors, constructors, a chief of police and even a famous singer arrested. Meanwhile, the mayor of a mountain village is under investigation for urban corruption. Salvador Rodríguez, who has leads the council of Carataunas in la Alpujarra, allowed for the construction of a 24-house development on land which the regional government claims is rural. According to claims in the regional press, the municipality’s technical architect and secretary have also been charged. The state prosecutor alleges the three defendants ignored a 2007 ruling by the Junta de Andalucía, which asked for work on the complex to stop. They deny the allegations, claiming the land was classified for development.